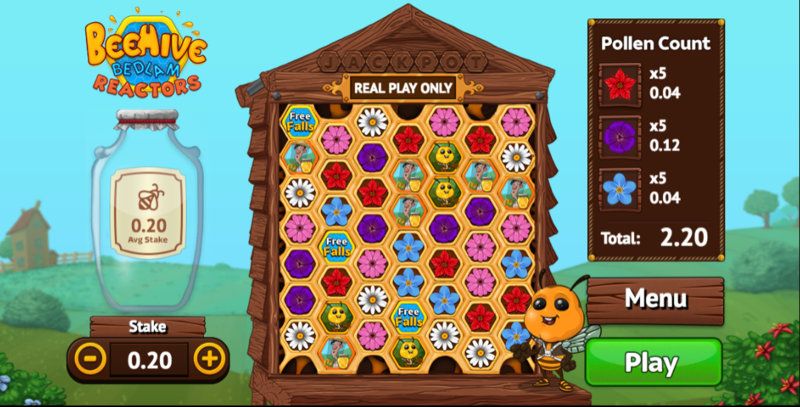 We all know that bees play a vital part in our ecosystem and it’a only fitting that they should be rewarded with an online slot of their own; Beehive Bedlam Reactors is really more of an arcade game, it’s developed by OpenBet and it comes with several bonus features as well well as a progressive jackpot. Beehive Bedlam is played on the side of a beehive in which there are seven horizontal and vertical positions; when you press ‘play’ wins are formed by landing groups of five or more matching symbols and this will be noted in the ‘Pollen Count’ area on the right hand side. That group of symbols will then disappear so more symbols can fall in from above. The standard symbols are Buzz the bee, a daisy, a purple flower, the beekeeper, a pink flower, a blue flower and a red flower. There’s no wild symbol but there’s a Free Fall bonus icon which activates one of the features during the free spins round you will also see the queen bee and the boss man. The more valuable queen bee and boss man symbols appear during this round and it’s possible to trigger more free falls by landing more groups of bonus icons. 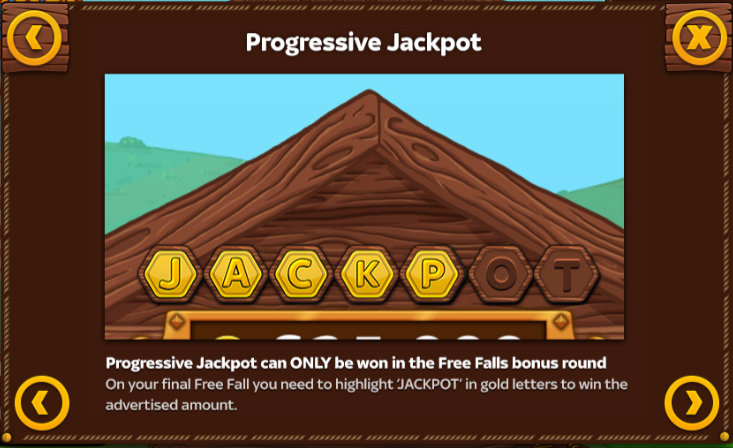 On the last fall bees will fly across the top of the screen and drop letters of word ‘Jackpot’ into the available positions – if they complete it you will win the progressive jackpot. The honey ja to the left of the reels will gradually fill up each time you land a group of beekeeper symbols; filling the jar will trigger the bonus game which involves you controlling the bee as a he flies across the screen, avoiding the obstacles and collecting coins. Completing the bonus will move you one step along the ten necessary islands to complete each world and receive a prize payout. Various achievements are available during gameplay such as triggering your first Free Fall bonus and you can see what you’ve managed to accomplish in the paytable. Beehive Bedlam is a really entertaining slot which will provide a large amount of very small wins; it offers a guaranteed Honey Jar bonus feature as long as you play long enough and you should find that it’s very easy to retrigger the Free Falls from within that round.